You can now find Seattle’s largest fireboat, the 108-foot Leschi, at Fire Station 5 on the west end of Madison Street, right between Colman Dock and the legendary Ivar’s Fish and Chips Restaurant. You may have caught a glimpse of Seattle’s largest fireboat, the 108-foot Leschi, when it shoots its water cannons during spring and summer drills on Elliott Bay. Or you may have seen it during public events such as Opening Day of boating season, which is coming up May 5. 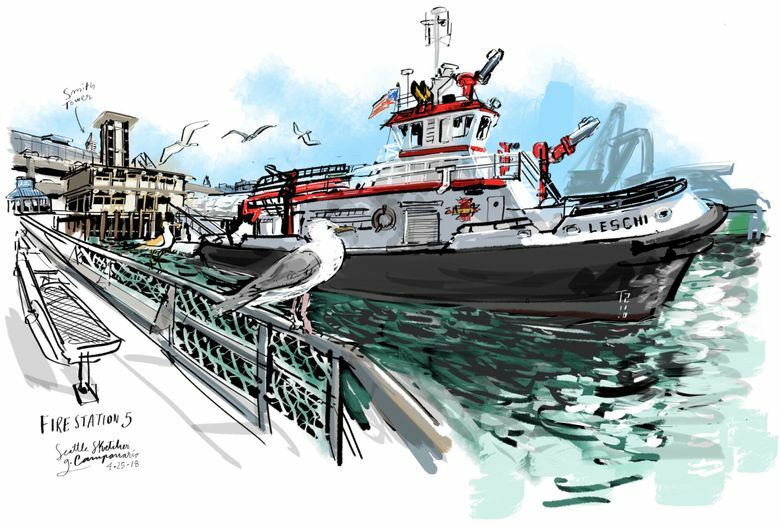 To see it up close while it’s docked, you can now find the Leschi at Fire Station 5 on the west end of Madison Street, right between Colman Dock and the legendary Ivar’s Fish and Chips Restaurant — look for the outdoor walkway where people are having lunch and feeding the seagulls. The historic waterfront fire station closed for the seawall construction and seismic upgrades in 2014 and just reopened this week. I’ve sketched a number of important Seattle vessels over the years. Historic ships such as the Arthur Foss and the Virginia V, and working boats such as the Western Towboats Arctic Titan and the Seattle Police Harbor Patrol. I’m glad to finally add one of the Seattle’s most important fireboats to my collection. P.S. : After the statue of Ivar Haglund awhile back, this sketch continues my occasional sketch-walk exploration of Madison Street, the only Seattle street that runs uninterrupted from Elliott Bay to Lake Washington. If you’d like to suggest a stop along the way, I’m all ears!